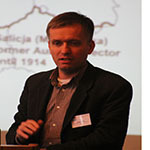 The paper will discuss the ways the stigma of the Eastern Europe functions and is dealt with on a regional level. The specific case study will be Eastern Poland and its regional identity discourses. On their example it will be shown how the intellectual and public discourses on regional level may accommodate the eastern dimension of their identity. The reactions to be discussed, besides the classic “relocation” of the “real” east eastwards and victimization, include rejection, redefinition and avoidance of the “eastern” dimensions in the regional identity discourses. Particular attention will be given to attempts at removing the oriental stigma with the uses of Western European intellectual discourses. These uses will be demonstrated on cases of application of ideologies of new regionalism and the borderlands paradigm. In the same time contemporary references to traditional ideologies like the Polish “Kresy” discourse will be also taken in to account. These identity transformation processes and debates in Eastern Poland will be presented in a lager Polish and international context of continental East-West dichotomy and other center-periphery cleavages.